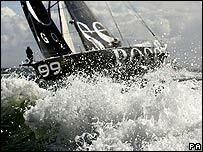 More than half of the competitors have pulled out of the Fastnet yacht race because of adverse weather. Some suffered damage off the Dorset and Devon coasts and by Tuesday afternoon 149 boats were forced to retire. A total of 271 yachts left Cowes on Monday to cover the 608 miles (978km) to Queen Anne's Battery in Plymouth via Fastnet rock. The race should have started on Sunday but was postponed after organisers received a severe weather warning. A race spokesman said: "Boats have been streaming into Plymouth, the race finish, and other ports along the Devon and Cornwall coastline after they elected or were forced to retire and head for shelter. "For some boats it was not so much the wind but the accompanying sea state that was proving exhausting for the crews." The race leaders were closing in on the Fastnet Rock where conditions were reported to be north-easterly at 15 knots, the organisers said. The leaders are due in Plymouth on Thursday. Hampshire's Dee Caffari has already withdrawn her yacht, Aviva Ocean Racing, because of damage to the bottom of the mainsail. 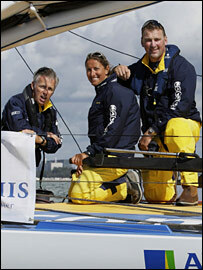 But neither Caffari nor her crew, Mike Broughton and Matthew Pinsent, were injured. "The 38 knots of wind created huge holes in the sea that the boat slammed into time and time again," said Caffari. "The fact that half the fleet have pulled out and even Mike, a veteran of 13 Fastnet races, is finding this race tough is testament to the severity of the conditions." Olympic rowing champion Pinsent, on board in a non-participatory role to film a special report for the BBC's Inside Sport show, said the decision to retire was the correct one. He told BBC Sport: "It is pretty horrendous when you are being bashed around and the boat is creaking and groaning in quite an alarming way. "I had suffered bouts of sea sickness throughout the day and managed to get some sleep last night but it was obvious to me that when Dee made the announcement that it was the right decision. "I would have been happy to carry on if it was more of the same but, if it was going to get worse, I'm not sure how much more either I or the boat could have taken really." Salcombe lifeboat has also rescued a 36-year-old man who broke his leg on board one yacht. He has been taken to hospital. The 300-strong field is the largest since the disastrous race of 1979. Seventeen sailors died in that event after the yachts were caught in a vicious storm off the south coast of Ireland. Organisers said the decision to delay the start was made after the severe weather warnings were issued by the Met Office. RORC racing manager Janet Grosvenor insisted that was the right decision to make, despite the fact that many boats had retired on just the second day of sailing. "We postponed the start by 24 hours so that the bulk of the fleet would not be in Western Channel or the Celtic sea where they would be very exposed. "The boats had the opportunity to retire and seek safe shelter so I'm sure we did the right thing. "There is disappointment, as a lot goes into planning, and for some people this was their first race, but we are relieved they are here safely."